Photo by Danielle Scott from the Torontoist Flickr Pool. 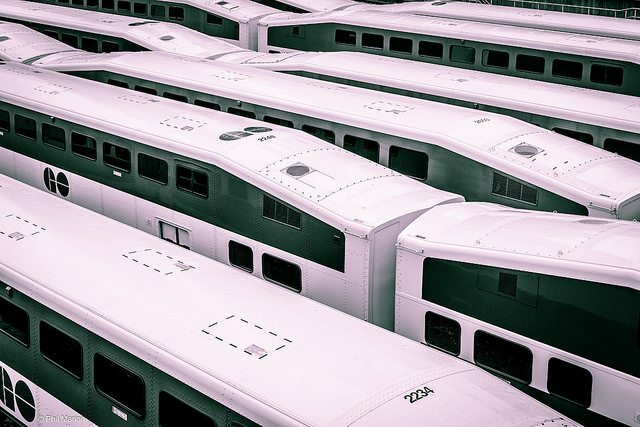 On July 12, Toronto City Council faces a mountain of transit reports. The Scarborough subway extension is the high-profile issue, but many more demand Council’s attention: The Crosstown East and West LRT extensions, the Waterfront LRT, congestion relief on the subway, SmartTrack and the role of GO Transit, and fare integration with transit systems beyond the 416. The challenge is to move from debates about individual lines to a network view. More is involved than drawing lines on a map. Crayons and paper are cheap, but a transit network will cost billions. Does Council have the discipline to spend wisely, face the cost of its decisions, and raise the funds needed to build a network Torontonians can ride in their lifetimes? The Scarborough extension project has evolved from a simple transit project to a political act of faith in the one true way to the fulfillment of Scarborough’s destiny. Support from a strong faction of Scarborough politicians both at City Hall and Queen’s Park is coupled to a manufactured sense of entitlement, a belief that anything less than a subway denigrates Scarborough’s role in the amalgamated city. The debate is not about the merits of any technology. For a time, the subway option seemed inexpensive enough that councillors who might otherwise favour the LRT plan voted to keep peace in the family, accepting that other parts of the transit network could provide benefits the subway would not. But with subway costs drifting upward with every report, the choice is much harder. Add to this the TTC’s last-minute claim that an LRT line would cost far more than originally thought, and the stage is set for a competition between rival “expert” views and the unshakeable certainty that the subway is worth its cost, no matter what. But Scarborough is more than a subway line to the Town Centre. Other transit proposals affect Scarborough, and their collective effect is much more than the subway alone. The Crosstown East LRT to University of Toronto’s Scarborough campus is at least as important as the subway because it will bring better transit to eastern Scarborough, an area ignored since the demise of David Miller’s Transit City plan. With many stops along the way, this LRT puts rapid transit in reach of far more people and touches neighbourhoods in a way the express subway to STC never can. The Sheppard East LRT, if it is ever built, would add a northern edge to a Scarborough grid. 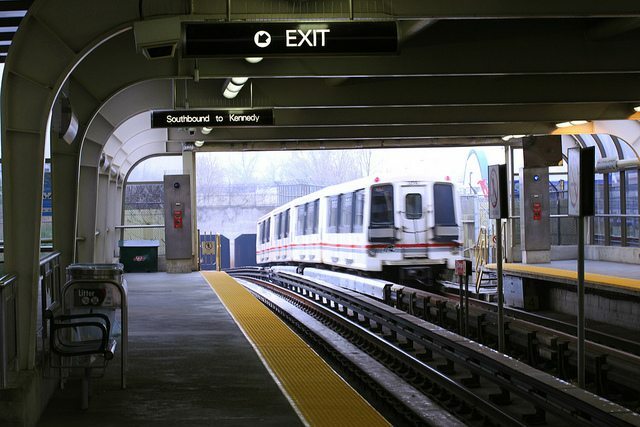 The problem lies in the middle where an LRT line from Kennedy Station could reach northeast across Scarborough to Malvern, an option the subway will not provide. SmartTrack fits into this plan too, although it complicates decisions with the changes in service levels, stations, and fares from the original hopes fuelled by John Tory’s election campaign. The total bill for Toronto’s share of SmartTrack is probably lower than originally expected, but issues of operating costs and fares remain unanswered. Planning studies already considered by Council show that SmartTrack is an effective alternative transit route only with frequent service and full integration with the TTC fare structure. Neither of these is a certainty as the current preferred option gives only seven trains per hour, and notions of changing a “TTC fare” to a premium, distance-based scheme for rapid transit lines hangs in the air. Photo by wyliepoon from the Torontoist Flickr Pool. More than two decades of plans for waterfront transit, including a few approved environmental assessments, have actually built very little. The lakefront from Humber Bay to the Don River is the hot area to build, but transit has done almost nothing to keep pace with rising population and imminent demand from developments already in the pipeline. The Port Lands, an area the size of downtown Toronto, will only add to the importance of waterfront transit. 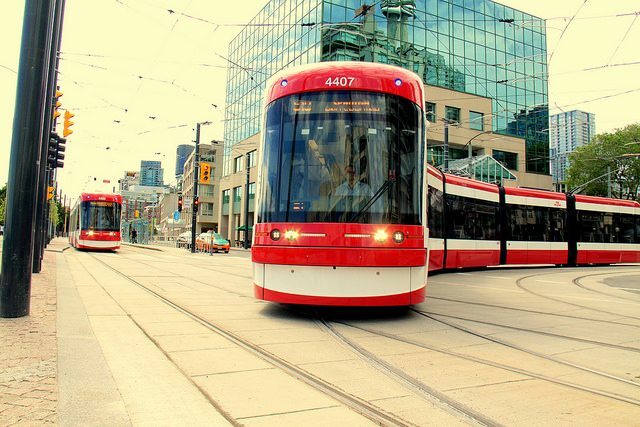 A short distance north, both the King and Queen streetcar lines face chronic crowding thanks to rising populations along these routes while the TTC does little to improve service capacity. Peak service on King today is not much better than it was more than a decade ago, with buses providing not extra service but simply replacing streetcars unavailable thanks to their old age and delays in the arrival of a new fleet. Queen too sees the pressure as higher density development moves north in the central part of the route, and new towers line the route at Humber Bay. This part of the network has been largely ignored in transit debates because it is not a high-profile, expensive subway line, merely a challenge to improve surface transit. The original scheme for a heavy-rail extension from Mount Dennis to the commercial area south of Pearson Airport was a non-starter from the day the Tory campaign announced it. Facing the impossibility of this option, Mayor Tory acknowledged that an alternative, the LRT that had been planned as part of Transit City, would work better as the western leg of his “SmartTrack” network. Like its eastern cousin, the Crosstown West LRT will have multiple stops and bring rapid transit to more people than the original railway alternative, and it can be taken into Pearson Airport itself. The airport authority has a newfound interest in better transit to serve this large employment node (not just the airport, but the many businesses clustered around it), and the Crosstown West can address part of this need. An essential part of SmartTrack is that the GO corridors evolve from serving only 905-based commuter trips with the addition of inside-Toronto services at fares that would make SmartTrack part of the local TTC system. To that end, new stations would add GO service at up to six stations serving western Toronto, the southern rail corridor near the waterfront, and Scarborough. Metrolinx has asked that council decides which stations it actually wants and will pay for by November 30, 2016, so that the work to build them—including not just platforms but also substantial rearrangement of existing GO trackage—can be part of the GO expansion contracts to be launched over the winter. The emergence of a subway Relief Line as a vital project for Toronto’s future is probably the key outcome of years of study and political wrangling. Toronto and, most importantly, the TTC no longer treat the Relief Line as a short and too-expensive bypass for Bloor-Yonge Station’s transfer woes. Now, “relief” is a new north-south line reaching through Thorncliffe Park into Don Mills and northwest to Dundas West station. Even Queen’s Park sees that this route is important, as it has dedicated substantial funding for design studies. For his part, Mayor Tory no longer claims that SmartTrack eliminates the need for a Relief Line and recognizes that each has a role in the transit network. The project has two big challenges. First, it will be very expensive, and there is no way to avoid the need for subway construction through some difficult areas including the business district. Second, acceptance of this project depends on breaking the mindset in which any spending on “downtown” takes distant second place to plans in Toronto’s old suburbs. The double standard which views expressway reconstruction as a suburban benefit while downplaying the need for better transit that serves similar journeys must end. Years of low tax increases and a belief in mythical new revenue sources put Toronto deeply in deficit for funding of its capital and operating budget needs. This is not just a transit issue, but a severe problem across all city services. The blunt fact is that Toronto refused to pay its way in the naive belief that simply by tightening the screws, money would be found. Now we face a $29-billion backlog of capital projects and a difficult future for operating budgets without new revenue to pay for them. Council will consider possible new taxes later this year as part of its 2017 budget review, but decisions on new transit plans must include a sense of what is actually affordable. To put it another way, if council were only prepared to generate $100 million in new annual revenue, what would this buy? What would Toronto get for $200 million? Are promised funds from other orders of government, such as Ottawa’s infrastructure package, demanding a commitment and funding scheme for Toronto’s share in the next few years? The inability to decide on new revenues, or worse the pretense that they were not required, has been the major failure of this council and the Ford administration that preceded it. Drawing lines on maps is simple compared to deciding how to finance a transit plan and parcelling out the cost among residents and businesses who all scream the moment the words “tax increase” are heard. All the bluster about support for transit and the future development of Toronto is empty wind if council will not commit to paying the bills. The coming debate will focus almost entirely on Scarborough, but much more is at stake.